Southern African farmers were still recovering from a devastating drought when reports of fall armyworm infestations arrived in December 2016. Zambia was the first country to be hit, followed by Zimbabwe and Malawi before the moths spread to South Africa in February 2017. Armyworms were also found in Namibia, Mozambique, Democratic Republic of Congo, and have now arrived in Uganda, Tanzania, Kenya, and Ethiopia. 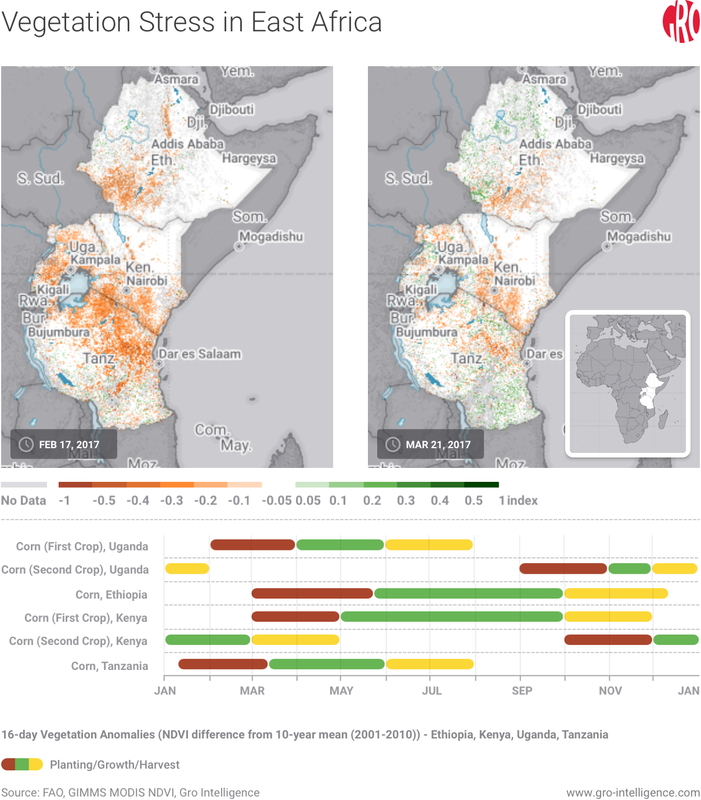 A variety of factors have helped control the pests in Southern Africa, but based on our analysis of weather data and environmental signals through Gro, it’s unclear if farmers in East Africa will be as lucky. Armyworms are caterpillars that attack staple cereal crops, such as corn, wheat, sorghum, and rice. The more typical African armyworms invade visibly from the outside of the target plants. Fall armyworms, which are native to South and Central America, are difficult to detect because they attack from inside. They therefore have the potential to cause heavy damage. 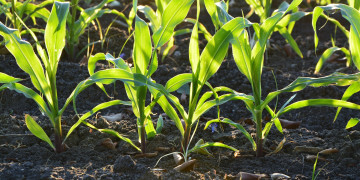 Despite the development of some resistance in the US, farmers can use pesticides or plant genetically modified (GM) Bt corn to alleviate the potential destruction. Cold weather and rain can also help prevent the spread of fall armyworms. They typically thrive in tropical temperatures similar to their native habitats and water weighs down their wings, making it more difficult for them to fly. Proactive stockpiling of agrochemicals by the government, adoption of GM seed by growers in major provinces, and some fortuitous weather have combined to enable South Africa to escape the initial scare. 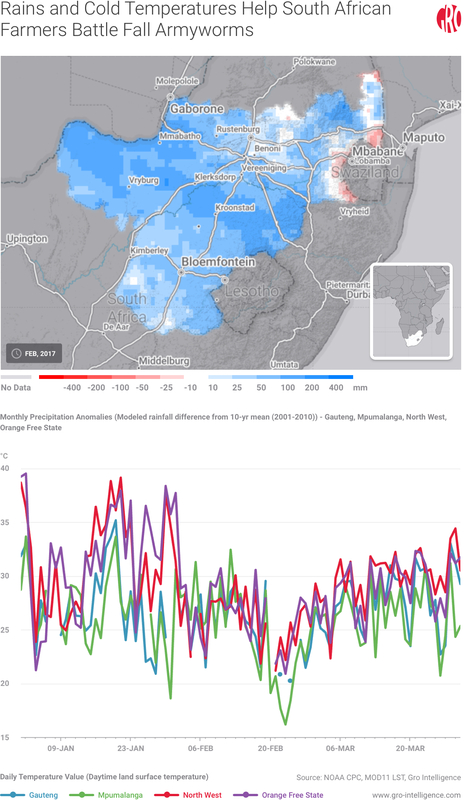 South Africa’s corn belt, which is the area composed of the Free State, the North West, Gauteng, and Mpumalanga, has received abundant rains in February when compared against historical, seasonal values. The provinces also experienced a February that was colder than normal, with land surface temperatures in 2017 that were 1.5 to 7.3 degrees Celsius below the average 2001-2016 February temperature. The wet and cold climate resulted in an inhospitable environment for the armyworms to spread. 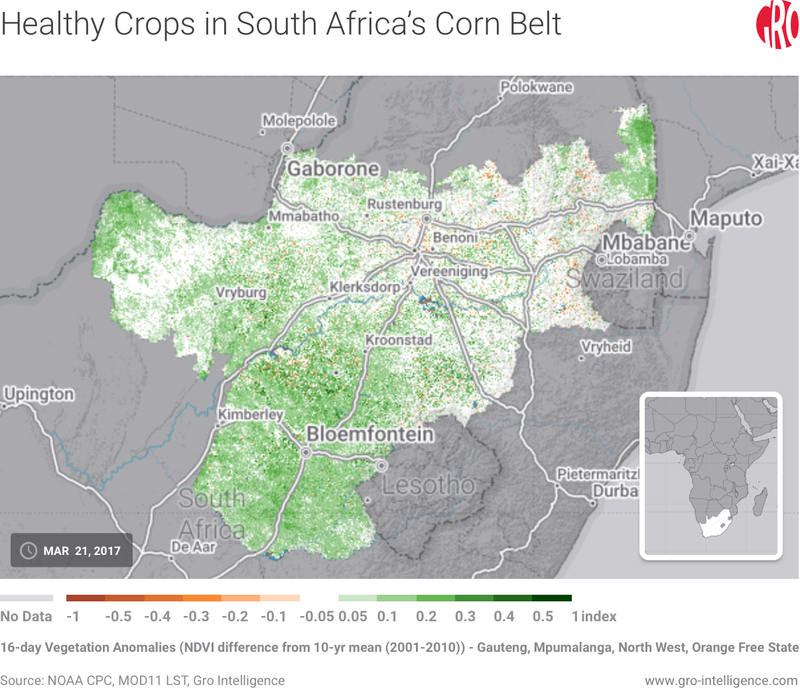 In fact, South Africa is expected to post a record corn crop this season, as most of the crisis was contained to crops in Limpopo, near Zimbabwe, and certain areas of the North West. Growers in the Free State and Mpumalanga are more than offsetting the isolated impact, with planted acreage and yields expected to be significantly higher than last year. Vegetation anomalies, which compare the health and abundance of current vegetation against historical values, indicate healthy crops in the corn-producing regions. South African farmers have an advantage over their neighbors in Zambia and Zimbabwe since they can grow GM corn whereas farmers in Zambia and Zimbabwe legally cannot. But even without GM seeds, the worst also seems to be over for Zambia. The country’s government responded rapidly and sent its air force to transport pesticides to farmers in December. In Zimbabwe, however, farmers have no clear information on remedies or any help from the government. Rumors are plaguing farming communities and experts fear that a tenth of Zimbabwe’s 2017 corn crop could be lost to armyworms. In March, the armyworm infestation was confirmed in Uganda, before spreading to Tanzania and Kenya, and moving onto southern Ethiopia. The governments of Kenya and Uganda have allegedly responded to reports of infestations by setting aside funds for pesticides to be distributed and to teach farmers to spray their crops as a preventative measure. For Uganda, the initiatives may not be enough. The agriculture ministry announced that the armyworms are likely to damage up to 15 percent of the country’s corn harvest this year. In the most-affected central and western areas, up to 40 percent of corn crops in certain zones have been harmed. In Tanzania, the armyworms have mainly impacted areas in the west and in Kenya, the armyworms are concentrated in the former Rift Valley and Western provinces. Infestations in Ethiopia have gathered in the southern region, according to the most recent reports. In this area, daytime land surface temperatures have hovered around 30 degrees celsius and the last ten days of March were particularly dry. Regardless of the government efforts, the warmer, drier climate in the region may lead to a more welcoming environment for the fall armyworms. In view of the increased risk, East African governments can take additional measures to help curtail the insects. They can work together with NGOs to improve training sessions for farmers and help with early monitoring and detection of fall armyworms. They can also form risk-sharing arrangements with private companies to encourage them to stockpile pesticides. 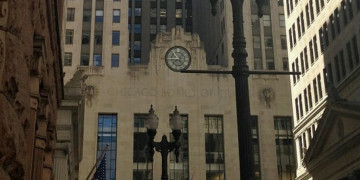 In exchange, private companies would offer discounted prices for these chemicals to farmers during times of national agriculture emergencies, such as the present. Like Zambia and Zimbabwe, Uganda, Tanzania, Kenya, and Ethiopia all currently do not allow GM crops. While Uganda, Tanzania, and Ethiopia have been moving forward with trials of certain varieties, Kenyan agriculture officials recently announced that the country was not yet prepared for such tests. As an alternative to heavy pesticide use, planting genetically modified crops can provide farmers with a less toxic form of resistance to infestations, which is especially helpful due to the difficulty of detecting the pests. 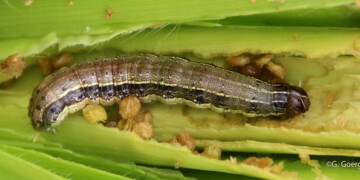 Fall armyworms are assaulting crops in Eastern and Southern Africa. Unlike in the South, East Africa suffered dryness early this year. For now, the armyworms appear to be contained in southern Ethiopia, and vegetation in northern Ethiopia still seems to be healthy. However, as the peak growing season begins in June, it will be critical for Ethiopia to contain the crisis before major crops are hit. 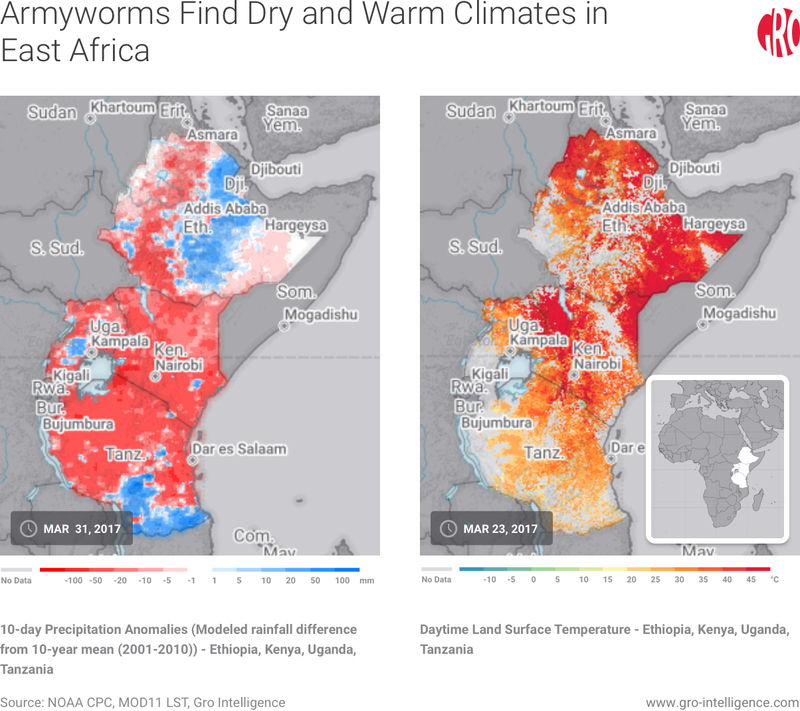 Based on our assessment that the environmental data signal hospitable conditions for armyworms, and our understanding of currently inadequate government countermeasures, we at Gro Intelligence worry that East African food supplies will fall short this year. This unfortunate confluence of disadvantageous weather and a lower level of institutional support renders the Eastern part of Africa significantly more vulnerable to insect attack than the South.